The famous Echoplex guitar pedal is still a ‘must-have’ effect for any guitarist. 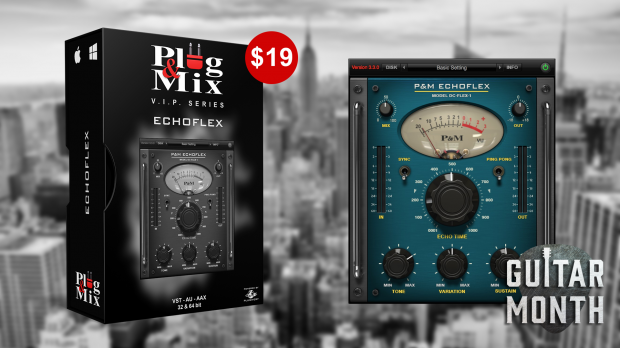 The P&M plug-in version with its classic sound is a ‘no-brainer’ deal at $19 right now. Based on the famous Echoplex guitar pedal. This tape delay effect was used by almost all of the most notable guitar players of the 60′s and 70′s eras. The echo timing is tempo sync-able and can be switched from stereo to mono. Use the tone and variation knobs to achieve creative feedback echoes. The sustain knob increases the feedback for creating endless delay tails. Turning the big Echo Time knob during playback or by using automation can cause some interesting tape-style effects that are popular in dub and experimental music. This entry was posted in DontCrack, Plug & Mix, Plug-ins, Promotions and tagged Echoflex, Echoplex guitar pedal, Plug & Mix, Plug and Mix, tape delay effect. Bookmark the permalink.